Recorded in Sao Paulo, Brazil, in 1958 (Dez Dedos Magicos) and 1959 (O Menino e o Violao). Producer: Isaias Sávio.Produced Under License From Warner Music Brasil Ltda. Producers of re-issue: Hector Martignon and Joachim "Jochen" Becker. Art direction and package design: Jack Frisch. When I was seven years old, I had an almost casual, but lucky start on playing guitar. My father Manoel Carlos was taking guitar lessons with Benedito Moreira, although without making much progress. Meanwhile, I was watching the lessons with big interest and started to play, learning what my father didn't. When my interest in studying guitar had become obvious to my parents, I was given the opportunity to continue the lessons, as my father quit. From age seven to ten, I made fast progress, and also learned basic music theory. My repertoire started to grow rapidly. At age ten, when I was at a music store in Sao Paulo, I met Luis Bonfá (1922 - 2001), the internationally known guitarist and composer. Bonfá immediately told my father that I had a special talent and that I should continue my studies with the great Isaias Sávio (1900 - 1977), who had also been Bonfá's guitar teacher since he was twelve years old. Sávio graciously accepted me as his student, telling me that I needed to change my right hand technique, and he provided me with a solid musical foundation. I was quite overwhelmed, but enthusiastic about Sávio's significant re-structuring of my playing technique, including new repertoire that was refreshing, challenging and stimulating. My progress was fast and my enthusiasm always big. At age twelve, the thoughts of my debut developed and Sávio said that I was ready. I was featured on a Brazilian TV variety show in 1957 which featured young artists, and the reaction was very favorable. My solo concert hall debuts in Sao Paulo (November 1957) and Rio de Janeiro (March 1958) were also successful. The programs of my concerts were conceived by Sávio, with repertoire ranging from classical to contemporary, including Brazilian. An immediate interest developed from the Chantecler label, initially part of the RCA Brazil label group, to record an LP with me. The recording sessions were held at a studio in downtown Sao Paulo, in July 1958. It became the first LP both of the new label and of myself, entitled Dez Dedos Magicos [Ten Magic Fingers]. That first recording experience truly enhanced my musical awareness, attention to details and helped my play grow. From there on, each recording I made was a very special experience to this day. With the success and high press acclaim, plans were soon made for a second LP. The musical format followed the same general concept of a varied repertoire, this time also including two Spanish pieces and a couple of Brazilian tunes with an Amazon flavor. Entitled O Menino e o Violao [The Boy and the Guitar], my second LP was released in 1959. I also furthered my musical studies with the composer Theodoro Nogueira (1913 -1975), who became very influential on expanding my musical horizons and encouraged me to start arranging for guitar. My tours became more frequent, helped by the recording exposure. I thank Jochen Becker for his enthusiasm for conceiving and organizing this re-release project. After so many decades lying dormant, here is now an opportunity of revisiting the music of the very beginning of my career. Carlos and I were introduced by a mutual friend, the classical and jazz producer Heiner Stadler in New York in 1998. Heiner was also Carlos' producer for his final CD releases for Concord Records. After Carlos' long-time business and recording relationship with Concord Records ended, he was open to releasing his new CD projects with my just-started ZOHO label. ZOHO has since been privileged to release six CD projects with Carlos so far: Siboney, Frenesi (both 2004), Carioca (2006), O Boto (2007), Merengue (2009), and Beatlerianas (2013). Few people have been aware of Carlos' early, wonderful eight LP releases from 1958 - 65, on the Sao Paulo, Brazil-based Chantecler label. The first of these, Dez Dedos Magicos [Ten Magic Fingers] from 1958, Carlos recorded when he was 13 years-old! Together with Carlos' second recording O Menino e o Violao [The Boy and the Guitar] from 1959, these two albums display an astonishing technical brilliance and artistic maturity way beyond his years. These early LPs have been out of print for several decades. They have been rare and sought-after by vintage guitar music collectors on the used LP market, where occasionally a copy of one or the other might become available for sale once every several months, usually on the Web, or at one of the specialist used LP dealers in Brazil, and usually at high prices. None of these LPs were ever previously released on CD or digitally! The two origi nal Chantecler LP covers from 1958 (left) and 1959 (right). After discussions with Carlos, we decided to track down the owners of the LP masters, and to look into the possibility of re-releasing these eight Chantecler albums on CD, on my ZOHO label. After years of searching, we finally learned that Warner Bros Brazil owned the Chantecler catalog, including Carlos' masters. 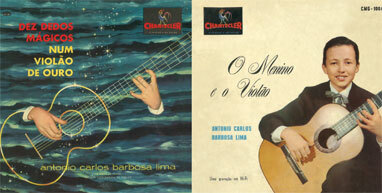 After several unsuccessful attempts to enter into a dialogue with Warner Brazil (WB) regarding licensing these initial first LPs for CD release, it became clear to us that the licensing process and the physical tracking down of the LP masters in the vaults of Warner Brazil could not possibly work long-distance from New York. As a result, we hired Luciana Pegorer as a Brazil-based consultant to take charge of the licensing and master- locating process for us. Luciana who had actually worked for Warner Brazil for several years, was able not only to re-open doors to WB to complete the licensing negotiations, but also to physically locate the LP tape masters in the vaults at WB where they had lain in an un-disturbed slumber since the 1970s! Luciana then also oversaw the process of creating "raw" digital transfers of the rather brittle half inch master tapes in a local Brazilian studio. When the ZOHO label received these raw digital transfers last year, we realized that they were in no shape to be released as such: sound quality was poor and uneven, and some tracks were either missing or mis-identified. Enter ZOHO artist, Colombian pianist and multiple GRAMMY nominee Hector Martignon into the picture who owns a small mixing and mastering studio in Harlem, New York. Hector graciously agreed to take on the project of restoring the entire group of eight albums for the ZOHO CD release. Over a period of several months, and in close consultation with Carlos, Hector undertook his painstaking restoration work, identifying the tracks, subtly "cleaning up", enhancing and equalizing the audio quality, balancing volume levels, repairing damages in the transfers, and mastering the results onto four chronologically sequenced CDs. The one you are holding in your hands, containing Carlos' two initial LP releases, is the first of these four. What is fascinating about the musical content is its unique mix of European Classical and Brazilian solo guitar repertoire of the 1950s. While the Brazilian repertoire were all original compositions for guitar, most of the Classical works were in fact arrangements of compositions originally for other instruments. Some of these pieces were also performed and popularized by Andrés Segovia (1893 - 1987) who later in the 1960s would briefly became Carlos' teacher. Interestingly, Carlos re-recorded some of this repertoire decades later - as some of these pieces are still in Carlos' active concert repertoire to this day - and it is instructive to compare the early and the later versions. 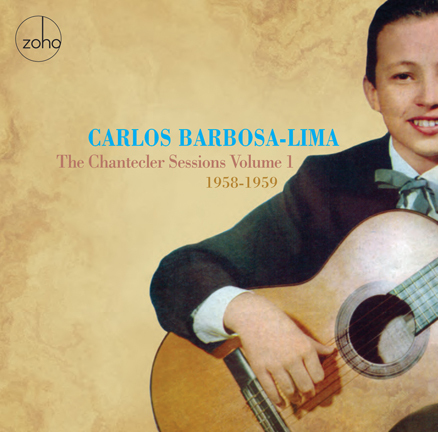 Today, almost 60 years after these early recordings, we have the benefit of hindsight about how Carlos' career continued, from his many groundbreaking stylistic and repertoire developments and innovations in Classical, Latin, World music and jazz guitar playing, to the many important new guitar works commissioned by, written for, and/or popularized by Carlos from composers like Alberto Ginastera, Ernesto Cordero, Antonio Laura, Byron Yasui and Leo Brouwer. But here, in these two albums, is where his incredible musical journey began.